(Nanowerk News) In the race to find materials of ever increasing thinness, surface area and conductivity to make better performing battery electrodes, a lump of clay might have just taken the lead. Materials scientists from Drexel University’s College of Engineering invented the clay, which is both highly conductive and can easily be molded into a variety of shapes and sizes. It represents a turn away from the rather complicated and costly processing—currently used to make materials for lithium-ion batteries and supercapacitors—and toward one that looks a bit like rolling out cookie dough with results that are even sweeter from an energy storage standpoint. With the publication of their recipe for “conductive MXene clay” in the Dec. 4 edition of Nature ("Conductive two-dimensional titanium carbide ‘clay’ with high volumetric capacitance"), the researchers suggest a significant shift in the way electrodes for storage devices are produced. MXene clay, made by researchers at Drexel University, can be rolled to any thickness while retaining its highly conductive properties. 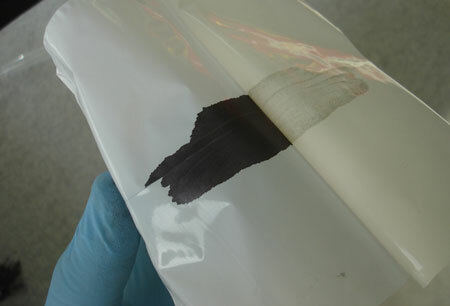 This new material could find uses in energy storage devices like batteries and supercapacitors.